So you thought I could go somewhere (anywhere) on vacation and not bring back any beauty goodies?? Impossible! During our trip to Kaua'i, I was delighted to discover a great local company with stores throughout the island called Island Soap & Candle Works. 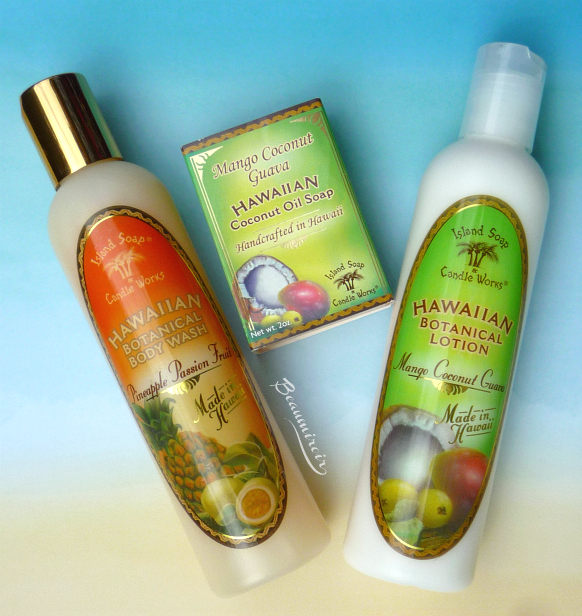 All their products are made in Kaua'i and feature delightful tropical scents such as passion fruit, coconut, mango, etc... I spent almost an hour browsing their beautiful store in Kilauea and picking some bath and body products to extend the Hawaiian experience at home. I didn't get any candles - they looked and smelled great but I already have so many candles that it didn't seem reasonable. 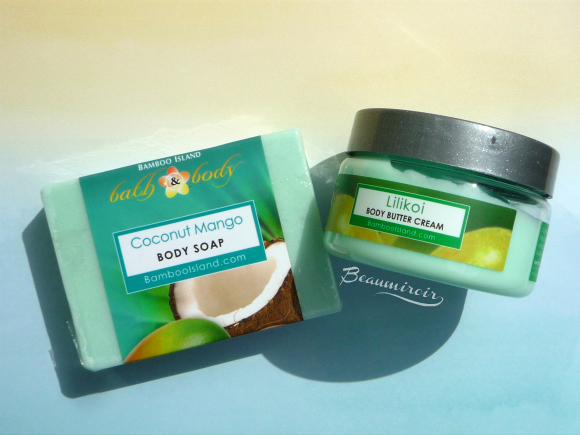 I also ran into a store called Bamboo Island in a small mall in Lihue, but I wasn't a big fan of their scents, they seemed too chemical to my nose, so I only picked a body butter and a soap. Island Soap & Candle Works has a Botanical line with vintage-looking labels that includes bath products and lotions. 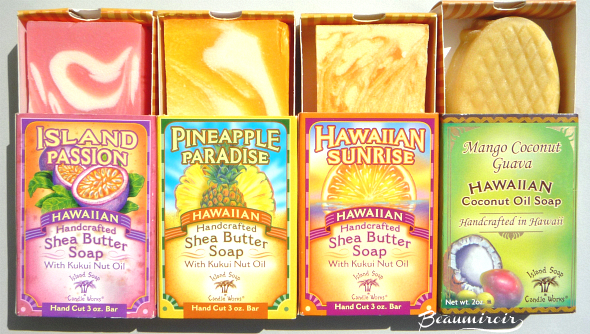 The scents are all featuring local fruits or flowers, and I picked the Mango Coconut Guava lotion and soap bar as well as the Pineapple Passion Fruit body wash.
Next, the store carries another line of fruit only products with bright, colorful packaging composed of bar soaps, lip balms (both sticks and tins) and shea butter body creams. I picked 3 soap bars (we use them a lot in the shower) and a lip balm tin, and I really regret not getting a body cream! Also pictured here is the Surfer's Salve, a natural soothing ointment made of olive oil and beeswax infused with plantain, comfrey, lavender, rosemary, aloe, tea tree and vitamin E. It's supposed to cure everything from sunburns to rashes, and I bought it to relieve the horrible itching from my mosquito bites (60+ bites on your legs will keep you awake at night, let me tell ya!). It did help! All the soaps are handmade and really cute. You can see the difference between the molded coconut oil soap (vintage packaging) and the hand-cut shea butter soaps (bright boxes). They smell HEAVENLY, and the scents are intense but not overwhelming. Finally, the 2 products I bought from Bamboo Island. I got really excited when I found that store because they had a 50% off everything sale, but the scents smelled... fake? Too synthetic? I don't know, but I was disappointed by pretty much everything I sniffed, including their candles (and for me to pass on a $3 soy candle in the cutest glass jar, the scent has to be REALLY off...). The lilikoi (passion fruit in Hawaiian) scent was the only one I truly liked, and I also randomly picked a soap containing coconut. Their products are also not made in Hawaii. Where to buy? 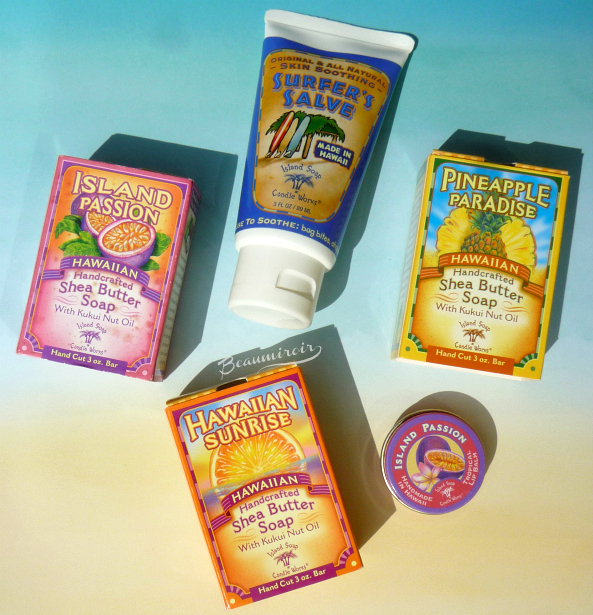 Island Soap & Candle Works has several stores on Kauai, and is sold in many gift shops and even some grocery stores throughout the island. You can also find it at various retailers on other islands in Hawaii, and, the good news, they have an online store that ships to the US, and one of their stores even ships internationally! 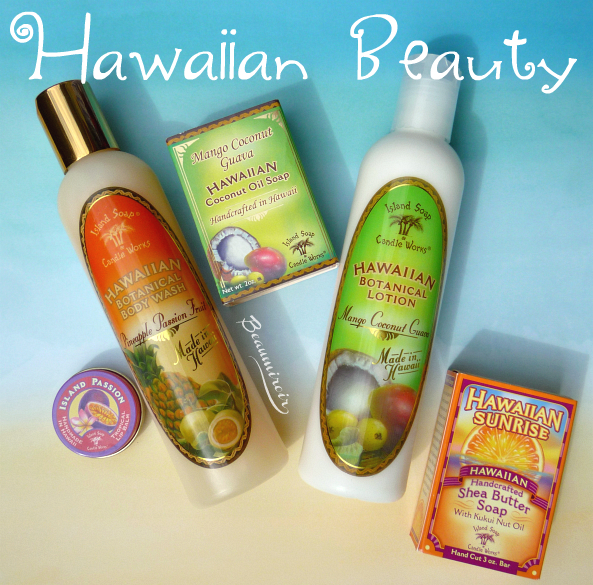 If you want bath and body products with tropical scents, this is a great place to shop. The products featured in this review were purchased by Lulle. I received no compensation to write this post, which only reflects my personal opinion. This post does not contain affiliate links.